It’s no secret that Eric Clapton’s chief influence remains the blues. His first love is in abundance on Slowhand at 70, a DVD and two-CD set showcasing a performance during his May 2015 residency at London’s Royal Albert Hall. 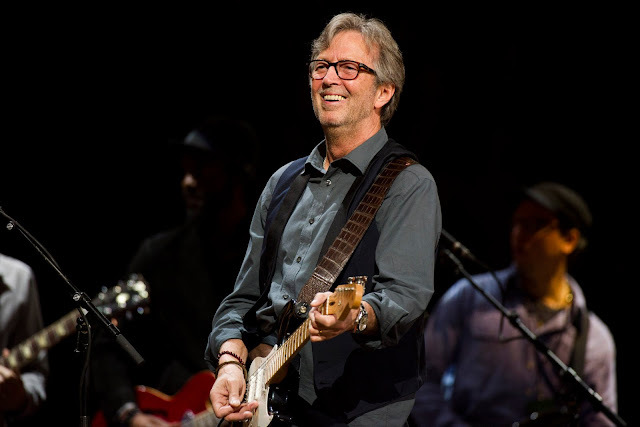 His voice and guitar skills in fine form, Clapton treats the audience to an overview of his career, performing select hits but mainly paying tribute to blues legends. Featuring a backing band full of top musicians such as Nathan East, Steve Gadd and Paul Carrack, Clapton begins with the J.J. Cale cover “Somebody’s Knockin’ at My Door” but returns to his early career with Derek and the Dominos’ “Tell the Truth.” While he explores his pop/rock side with the 1989 hit “Pretending,” the growl in Clapton’s voice grounds him solely in R&B. Unfortunately, the backup singers are positioned too high in the mix, at times overpowering the guitars. The problem continues in the otherwise stellar cover of Willie Dixon’s “Hoochie Coochie Man,” with Chris Stainton’s piano solo overwhelmed by the unbalanced mix. The right mix is achieved, however, for “You Are So Beautiful,” where Eric Clapton hands over lead vocal duty to Paul Carrack. As Carrack’s blue-eyed soul voice conveys the lyrics’ passion and sincerity, Clapton executes a tasteful guitar solo. Nathan East receives his turn on “Can’t Find My Way Home,” a song dating from another band from Clapton’s past: Blind Faith. The highlight of Slowhand at 70 occurs during his faithful rendition of Bob Marley’s “I Shot the Sheriff,” with the backup singers closely replicating the I Three’s original vocal arrangement. At 70, Clapton’s voice remains undimmed, and his enthusiastic performance on the song is irrefutable proof. He also expands the guitar solo, allowing for room to meditate on the instrument, leading the audience on a journey through his skilled guitar work. As Eric Clapton transitions into the “unplugged” section of the concert, he dazzles with a jaunty version of “Nobody Loves You When You’re Down and Out” and the still affecting “Tears in Heaven.” The latter gets a reggae makeover, but his voice sounds just as strong as it did upon the single’s first release in 1992. His hit MTV Unplugged reworking of “Layla” also earns an enthusiastic audience reaction, although he updates it with a slightly faster tempo and a popping guitar solo. While he dutifully performs the chestnuts fans demand (“Wonderful Tonight,” “Crossroads,” “Cocaine”), Eric Clapton clearly enjoys mixing in lesser known material such as “Let It Rain,” a track off his 1970 solo debut. Casual listeners may best remember the album for “After Midnight,” but “Let It Rain” was the third single cowritten with Delaney and Bonnie Bramlett. It represents how Clapton clearly did not want to overemphasize the huge hits. Instead, he turns the Royal Albert Hall concerts into personal statements, performing songs that hold the most significance for him. At the same time, he pays tribute to bluesmen that inspired him to become one of rock’s greatest guitarists. Slowhand at 70 portrays an artist who enjoys reflecting on his past, but Eric Clapton’s still-powerful artistry places him firmly in the present.